David is a Senior Analyst based in New York where he focuses on the closing and due diligence of direct buyout investments for Quilvest Private Equity. 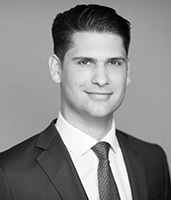 Prior to joining Quilvest, David was an investment banking associate at Barclays in New York within the Leveraged Finance Group. In this role he advised companies in the Consumer and Retail sectors on strategic transactions, including mergers and acquisitions, leveraged buyouts, and debt refinancings. David holds a bachelor of business administration in finance and accounting from Emory University.